The Guardian Employer’s Organisation (GEO) is an Employer’s Organisation registered in terms of the Labour Relations Act and has been operational since 1997. The GEO is focused on assisting employers with Labour Law issues, collective bargaining and provides a comprehensive Labour Law service backed by legal counsel and experienced and talented industrial relations practitioners. Our services are available through a national network of accredited GEO officials. The GEO currently represents and supplies advisory services to some 1000 member company’s country wide, through our offices based in Johannesburg (head office), Pretoria, Durban, Cape Town, Port Elizabeth, Witbank, Polokwane, Welkom, Nelspruit, Piet Retief and East London. The member companies to the GEO comprise of corporate (insurance houses, banks), road freight industry companies, motor industry businesses, manufacturing businesses, retail industry businesses, large bakery groups and many service industries all varying in size from a few employees to large unionised organisations and including privately owned companies, close corporations, NGO’s, Government Services and listed companies. 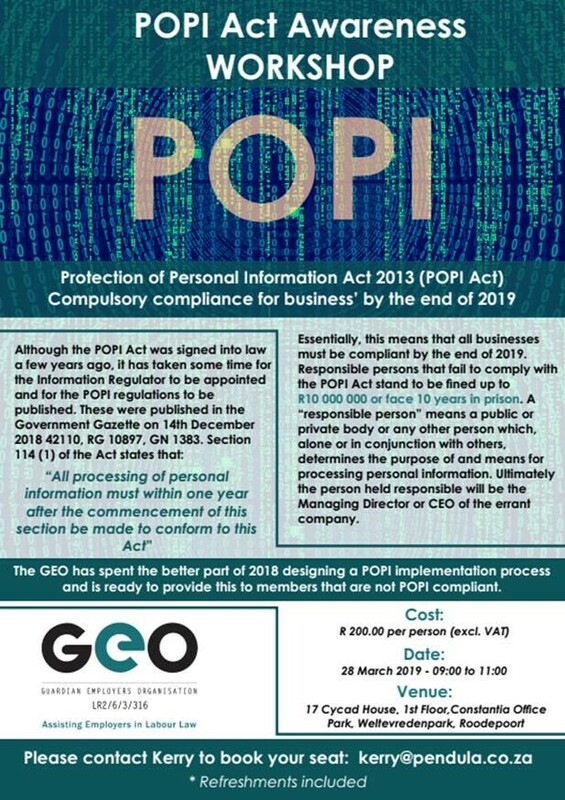 The GEO is well known in the dispute resolution councils of South Africa (including the CCMA and Bargaining Councils) and prides itself on the good name which has been created in dealings with dispute councils over the last 15 years. We provide a comprehensive Labour Law service backed by legal counsel and experienced and talented industrial relations practitioners. Our services are available through a national network of accredited GEO officials. The cost of representation at any conciliation, mediation and/or arbitration, whether private, at a Bargaining or Statutory Council or at the Commission for Conciliation, Mediation and Arbitration, and in the Labour Court is borne by the fund - T&Cs apply. The Member shall be insured annually against any arbitration awards made against the Member, as well as matters that the Member, at the discretion of the insurer, may decide to settle. On-site assistance provides for the chairing of disciplinary enquiries, grievances, transfer of business, retrenchments, counselling, incapacity, poor performance enquiries, union negotiations, strikes and much more. A 24-hour helpline is available to ensure that Members are able to obtain professional IR and HR advice at all times. Upon receipt of the first month’s Membership fee and completion of the Employment Relations audit, new Members receive a Manual containing all the necessary contracts of employment, recognition agreements and other documentation relevant to employment relations management and administration. The GEO is well known in the dispute resolution councils of South Africa (including the CCMA and Bargaining Councils) and prides itself on its good reputation gained in dealings with dispute councils over the last 19 years. The CCMA and Councils do not automatically permit legal practitioners to appear on behalf of employers, especially for misconduct cases. GEO officials however, are permitted to represent Members in all cases. In addition, the GEO has a 98% success rate. To be acknowledged as the leading registered employer’s organization providing labour relations expertise in the labour/industrial relations field. To provide a comprehensive professional labour and industrial relations service to employer’s in all fields of business. To conduct our business honestly and ethically. To strive to provide our clients with the best service. To be fair and ethical in our dealings with our clients and those whom they deal with in labour related matters. To treat our employees fairly, with respect and dignity. To encourage our employees to accept responsibility for their own personal development in order to reach their maximum potential. To create a work culture where employees promote our business and show personal commitment to their jobs and the company. To promote diversity and employment equity within our business. Employment Practice Liability Insurance in association with Camargue Insurance underwriters. SLA’s are drafted and maintained to meet individual Member’s needs. GEO equips its Members with as much information as possible in order to minimise and mitigate disputes. GEO has developed a unique industrial relations software system called CIRIS that enables Members to access essential information such as advice on procedural and substantive fairness, current legislation, news, case law and almost every document needed to manage and administer the HR/IR function effectively. GEO equips its Members with as much information as possible in order to minimise and mitigate disputes. GEO has developed a unique industrial relations software system called CIRIS, that enables Members to access essential information such as advice on procedural and substantive fairness, current legislation, news, case law and almost every document needed to manage and administer the HR/IR function effectively. The GEO provides access to a Labour Law portal at www.cirisonline.net. CIRIS is an industrial relations information system that provides users with useful up to date information on all aspects of Labour Law. Resources available on CIRIS include: notices, contracts, policies, latest case law, news, new legislation and much more. The site can be customised for employers specific policies and procedures. Contact 0824910708 should you be interested in a CIRIS demonstration. Assisting initiators with case preparation and presentation at disciplinary hearings. Lying on a CV has become the norm.. Double jeopardy - what does the law say.. Suspension with full pay - an irksome misuse of funds or a legal reality? Restraint of trade: can the restraint of trade clause be enforced within and/or during an employee's employment period? Reducing your employment relations risk profile: A list of steps an employer can take to reduce the risk. Examples of Insufficient information - Giving not the right amount of information can be too vague. Adding Alternative Charge - Additional Offences and how to add them. Examples of Correct Word Charges - Examples for use. When is a medical certificate a legitimate document to excuse an employee from work? - A list of 10 points of information needed on a medical certificate. Can fixed term contracts be renewed? - Can an employer remunerate a fixed term employee differently to a permanent employee in the same position? Theft or unauthorised removal of company property is commonplace in South Africa. Most of these incidents involve company staff. Understandably, employers have often been forced to go to great lengths to catch the culprits responsible for theft of company property. Desperation has often led to employers using ‘traps’ in various forms to try and catch these culprits. The use of traps is however, a controversial issue and considered to constitute a criminal offence.